In this week’s episode of The Whole Circle Podcast we talk to Dr Glenn Livingston, Psychologist about binge eating. Who is Dr Glenn Livingston? Glenn Livingston, Ph.D. is a veteran psychologist and was the long-time CEO of a multi-million-dollar consulting firm which has serviced several Fortune 500 clients in the food industry. Disillusioned by what traditional psychology had to offer overweight and/or food obsessed individuals, Dr Livingston spent several decades researching the nature of bingeing and overeating via work with his own patients and a self-funded research program with more than 40,000 participants. Most important, however, was his own personal journey out of obesity and food prison to a normal, healthy weight and a much more light-hearted relationship with food. 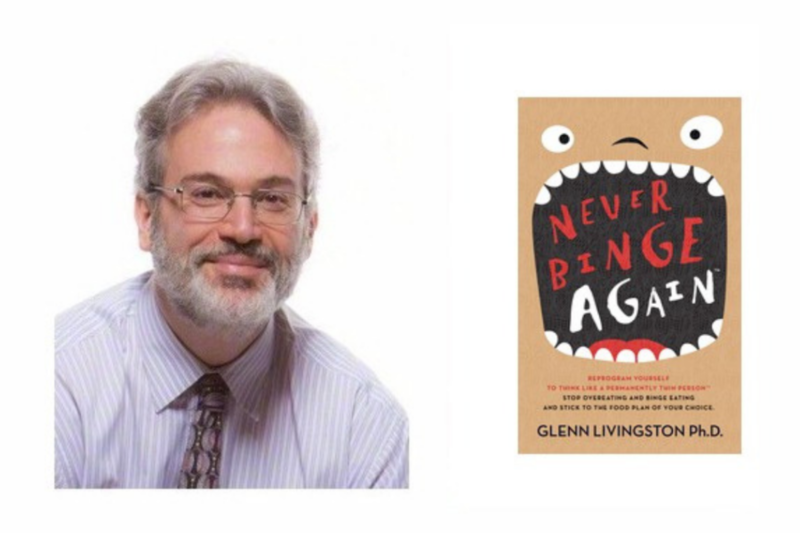 Dr Livingston is also a best-selling author of Never Binge Again – Reprogram Yourself to Think Link a Permanently Thin Person™. He also comes from a family of 17 therapists! Wow! Yes, that’s right he has 17 members of his family who are all psychotherapists in one form or another. You can check him out as well as downloading a FREE copy of his book here. Dr Livingston now specialises in working with people with eating troubles. He does this in a coaching framework instead of a treatment framework because some of the things he does are a little unorthodox and not necessarily in line with the practices of his profession. However, there is now research out there supporting his methods of practice. Dr Livingston had very serious troubles with food himself which is how he came to specialise in this area. When Dr Livingston was a child of around 16-17 years of age, he figured out that if he worked out around 2-3 hours a day he could eat whatever he wanted ie. 6,000 – 7,000 calories a day consisting of whole pizzas, boxes of muffins, chocolate bars etc. He loved it and did not think this was a problem. He would spend a lot of time eating, recovering from the food he had just eaten, and a lot of time exercising, but he was 17 so he figured it didn’t matter. When he was about 22 or 23 years old, he got married and had responsibilities as well as patients he needed to commute 2 hours each way to see, which means that he just couldn’t work out that much anymore. He could barely fit in 2 hours of exercise a week, let alone a day like he used to. However, he couldn’t stop eating the way he had been. It was like the foods he had been eating had a life of their own. Therefore, he was eating constantly and obsessing about it. At one point, he found himself sitting in a session with a suicidal patient and thinking when he could get a pizza. This was the turning point for him, he knew that this was not right, and it bothered him because it was incredibly important to him to be a great Psychologist. He found the mental obsession he had with food was worse than all the weight he gained. Being from a family of Psychologists he realised this was a serious problem, but he thought it stemmed from a void in his heart, something that he was missing. He figured that if he could heal what was going on in his heart and figure out what was ailing him psychologically, then he wouldn’t have the food cravings. He went to all the best Doctors, Psychologist, Psychiatrists, Overeaters Anonymous for years and he even took medication. He basically tried everything he could think of. It was a very soulful journey for him, where he learnt a lot about himself that had a big impact on who he is today. He doesn’t regret it, it was worthwhile taking the journey, but it didn’t fix the food problem. It was a constant cycle of two steps forward and ten steps back. There were three things that happened that flipped the paradigm about food for Dr Livingston. At this particular point in time, he didn’t have children, he wasn’t commuting for work but his wife at the time was travelling a lot for business. He had a second career consulting for very large fortune 500 companies. He started to realise that these companies were spending billions of dollars to engineer hyperpalatable food-like ingredients. They were designed to hit our bliss point without giving us the nutrition to feel satisfied. There was a part of Dr Livingston that knew this wasn’t right. He was thinking that that’s why those foods he couldn’t stop eating had a life of their own or why he was looking for answers at the bottom of a container. It wasn’t necessarily because his mother didn’t love him enough when he was little, it’s that these foods really did have a life of their own. Dr Livingston was reading a book called Rational Recovery by Jack Trimpey, who mostly works with drug and alcohol addictions. In the book Jack pointed out that the seat of addiction is caused by the lizard brain which is at the base of your skull and which is the most primitive part of our being. That part of our being doesn’t really know love. Lizards doesn’t know love when they see something in the environment, all they know is to whether to eat it, mate with it or kill it. Therefore, they don’t have concern for tribe, family, spirituality, music, art, creativity, contributions to society and there’s certainly no long-term strategic plan like diet or weight loss. It’s just eat, mate or kill. So why was Dr Livingston trying to love himself thin if the part of him that was addicted didn’t know love? From there Dr Livingston conducted his own study of 40,000 people. He asked those people what foods they struggled with and what was going on in their lives. What came out of this study were three really interesting things. People who struggled with chocolate tended to be lonely or broken hearted. People who struggled with crunchy, salty foods tended to be stressed at work. People who struggled with starchy soft things ie. breads and pasta tended to be stressed at home. Even knowing this it didn’t solve the problem Dr Livingston had with food. When he found out that people who struggled with chocolate tended to be lonely and broken hearted, he asked his mother given chocolate was his food struggle. At the time he wasn’t happy in his marriage, but he figured that couldn’t be the whole reason. So, he asked his mother what happened in his upbringing that set off the pattern whereby he would go to chocolate when he would feel lonely or broken hearted. His mother had this horrified look on her face and started to apologise. Dr Livingston’s mother told him that when he was a 1-year-old, his grandfather (his mother’s father) had just gotten out of prison. His mother had adored her father for most of her life and had oriented most of her life around him, but he was guilty for the crime he was sent to prison for. Because of this her life fell apart and she was very depressed and anxious a lot of the time and would just sit and stare at the wall. At the same time her husband, Dr Livingston’s father, was a Captain in the Army and they were talking about sending him to Vietnam (this was in 1965). This terrified her at the thought of being a single mother with another child on the way. She just didn’t have the wherewithal to love, hug or feed Dr Livingston the right things. There was one instance where Dr Livingston went to his mother for something and she redirected him to the bottle of chocolate syrup on the bottom shelf of the refrigerator which he then grabbed, consumed a lot of then went into a sugar coma because of. This then happened regularly and started his struggle with chocolate. From this, his problem got worse, not better. He did forgive his mother though and learnt a lot about the two of them in the process. However, his problem got worse because there was this little voice in his head telling him that it was ok to keep consuming chocolate because his mum had left a big chocolate sized hole in his heart. This was how he justified his continued eating of chocolate. What he recognised from that and from seeing the substances that the companies he was consulting for were engineering, was that you cannot really love yourself out of this. You have to learn to control your urges and behaviours and dominate those sensations like you do for all your other bodily functions. How did he overcome this? He called his lizard brain his ‘pig’. He drew a really clear line in the sand that differentiates healthy from unhealthy eating. For example, he would only ever cheat chocolate on a Saturday or Sunday again and would never eat it on a weekday. If he hears any little voice in his head that suggests he should have chocolate on a Wednesday and justifies it with a bunch of excuses, that would be his ‘pig’ squealing at him. So internally he would say that he doesn’t want that, his pig does, and he doesn’t eat pig slop (the chocolate representing pig slop) and he doesn’t let farm animals dictate what he does. As ridiculous and primitive as that sounds, it would wake him up at the moment of impulse and give him a few extra microseconds to remember who he was, what his plans were and why he made them. He didn’t always make the right choice, but what happened was that he recognised that he wasn’t powerless and that he could take back control of the process. His upper brain could control his lower lizard/pig brain. He kept a journal for eight years about him versus his pig and all the crazy things that it said and how he learned to recognise it and disempower it. Somewhere around 2014-2015 he was a minor partner in a publishing company and the CEO said they needed a book so that they could demonstrate that they know what they’re doing in an effort to get some bigger clients to jump on board with them. Dr Livingston said that he had written this crazy journal and the CEO wanted to see it, which he loved. He then asked him if he could make it into a book which Dr Livingston did and Never Binge Again was born! One of Dr Livingston’s mentors always said to him that he should never have to recover from a meal. So, if he felt like he had to recover from a meal then he should take a step back and adjust what he was eating. Once he had gotten a handle on his struggles with food, this mantra really shaped the food choices he would make going forward. How do you stop your body from binge eating? As Dr Livingston had eluded to earlier, he would allow himself one day to indulge in his favoured chocolate. But how do you only have a small portion of your preferred food without eating the whole lot, ie. a whole block of chocolate or a whole bag of chips? The easiest way is none is better than some. In the end Dr Livingston came to the conclusion that he just couldn’t have chocolate and as a result of him making that decision he has not had chocolate in years because he knew that he just couldn’t have a small amount, he would end up binging on it, even if only for one day a week. It wasn’t easy but he learned to live without it. Having said that, people are entitled to maximise their freedom and if they want to take the risk and try it, then it’s best if you spell out to yourself where the boundaries lie. What is your end goal? If you work this out, then it helps you to make clear decisions beforehand. For example, in Dr Livingston’s case he would allow himself to eat 4oz of 85% chocolate on a Saturday or Sunday, but not both days. This way you know exactly the boundaries you have stick to. There are a lot of studies on willpower that suggest that willpower is a fatigable muscle and there are only so many good decisions you can make during the course of a day. So, if you have already set the boundaries on your eating, then that eliminates having to make decisions in your already challenged food area or rely on willpower to get through it. Bear in mind that this doesn’t always work, especially if you have severe food addictions. Dr Livingston finds that the main food addictions centre around sugar, alcohol and flour. The psychology behind the what, where and how we eat is really interesting. Dr Livingston didn’t realise that when he was making rules such as, he wouldn’t have chocolate during the week, he was really making a decision to become the person who doesn’t eat chocolate on a weekday. When you overload your digestive system with food that doesn’t belong there, the body perceives that as an emergency, it diverts blood and resources to getting that through your system and it loses the ability to conduct your emotions at the same level. So, it can be said that there is an anaesthetic effect with food, more commonly known as eating food for comfort. But there is another reason that people are eating, if you believe you’re only eating for comfort then your internal pig can justify that over consumption of food based on your emotions because that’s what you’re feeding. However, we also overeat to get high from food. We typically don’t overeat on broccoli or healthy foods; we mainly overeat on junk food which can give us a synthetic high from industrially processed food. We tend to not think of this need for a high because we can’t justify it to ourselves as easily as we can eating to soothe emotions. The distinction is clear but not well-known. This is what Dr Livingston recommends people do. When it comes to food and food ‘drugs’, if you want to regulate this, if you commit to anything less than perfection then you are unlikely to succeed because it leaves you open to justify not giving it 100% commitment, which is what your internal pig wants you to do. However, if you are setting out to succeed at your goal then you need to visualise it and visualise the outcome so that you can stay focused on the prize. This allows you to purge your mind of doubt and distraction. If you miss your target, then you simply recommit and go again full steam ahead. It’s ok to feel guilt and shame at falling off the wagon, because this will be your driving force to do better next time because you will have learned from your previous mistakes. If you are constantly in a negative mindset and beating yourself up for not succeeding, then know that this is your internal pig getting to you. This is why you need to commit with perfection and forgive yourself with dignity to have the greatest success of not letting your internal pig getting the better of you. We’re programmed to feel guilty if we overeat, put on weight or are obese. But we really need to flip the switch on this and turn it into anger. Yes, we may have put ourselves in that position because we put the food in our mouths, however, the foods that are going into our mouths are highly addictive because of the addictive chemicals in them and how they affect our brains and retrain our brains to want more and more. This doesn’t excuse our own behaviour because we need to take ownership of that so that we can improve, but food companies have a lot to answer for with the addictive packaged foods they sell. That’s why it’s so important that we set our own boundaries around food so that we don’t succumb to food addictions and binge eat. Head on over to his website Never Binge Again. Over there you can get a free downloadable copy of his popular book Never Binge Again as well as receiving, via email, free printable food plan start templates. On his website, he also has free recorded sessions with people that you can listen to so that you can hear how this works in practice.